The Flip-Pal Scanner is a portable document and object scanner like no other. It is so versatile and user friendly that you will be amazed. What is so great about the Flip-Pal is its ultra portability and its scan in place technology created by Rocky Mountain Ventures Company (now called Couragent). The patented design of the Flip-Pal lets you see through the scanner in order to view what you are scanning. ﻿ You take out your scrap book and scan all the pictures inside just by placing the scanner on the page. You can leave the picture in the book and simply scan all of your pictures so you can keep a digital copy of your fondest items. Did anyone ever think there would be such a scanner? Now if you can believe that you can scan out of a scrap book, wait until you hear what else you can do with the Flip-Pal mobile scanner. How about scanning photos in place, even if they are still in the frame and still on the wall? Now that is quite an accomplishment. Imagine every one's grandmother getting to have a fully digitized copy of all of the photos hanging on the wall that give her precious memories of all her wonderful grandchildren. Don't you think grandma would like to be able to have a digital copy of all the photographs to hand down from generation to generation? I think she would love it. Another bonus would be the knowledge that the pictures would be save, clean and never again fading or getting dull over the years. The digital copy scanned with the Flip-Pal Scanner would be like keeping your photos in sealed package with all of the air extracted yet without the worry of all the problems that would arise by opening the bag. The Flip-Pal's scan in place technology is already changing the way we keep our family photos while changing landscape of how items get scanned. The Flip-Pal is equipped with amazing stitching software that turns this mini scanner into a monster of productivity. This Scanner can fit in your purse or briefcase yet it can scan large documents and pictures by chunking it in to sections. The scanner software allows you to use several sectional scans of a large document that will be seamlessly created into one large scan. It is extremely creative, useful and new. The creative suite software just added from Couragent is ideal for anyone interested in arts and crafts. You now have a away to keep your creations digitally with ease. Check out these sites for more information on how to buy a scanner. Turn your office space into a productivity Zone. The Neat Desk will save you hours of wasted time looking for paperwork. Your central inbox will be your Neatworks software with awesome scanner ADF that will scan everything. Create digital filing cabinet that is secure and paper free. With NeatDesk, you get a digital filing cabinet with keyword search capability and the peace of mind knowing you have all of your "paper work" at your finger tips. Say goodbye to multiple software applications. The Neat Desk and the Neat Receipts works great with NeatWorks , the simple, easy to understand and use proprietary program created by the Neat Company. It handles everything from business cards to legal documents. One stop shop for all your scanning. NeatDesk has a removable input tray that can hold a 50 page document for single sided scanner. This is an amazing scanner for all your documents. The power of Neatworks 4.0 is obvious here. Duplex scanning is no problem with the NeatDesk. NeatDesk will capture all imporant information from the card. Neatworks reads name, address, company and the contact's title. The bonus is that the Neatworks software creates a data base for you that is easily searchable at any time. Simple to export to other data bases and contact managers as well. NeatWorks and the NeatDesk is fully compatible with windows. Windows 7, XP or Vista work seamlessly with this excellent scanner from Neat Company. TryNeat! you will thank yourself later. 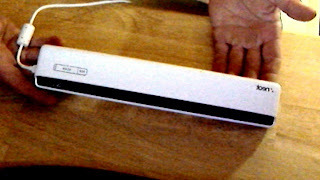 The Amazing Flip Pal Portable Scanner with FlipScan Technology. A must have for everyone! Portable Scanner Reviews: Flip-Pal is the Most Innovative Scanner: " The Flip-Pal Portable Scanner is a must see for anyone thinking of BUYING A SCANNER. The Couragent company has developed the most innov..."
The Flip-Pal now has announced the creative suite software that is sweet for anyone involved in arts and crafts. The creative suite is now available at the Flip Pal web site. The Flip Pal is the flag ship product for Couragent, formerly known as Rocky Mountain Ventures LLC, and last week they announced this brilliant creative suite software that turns the Flip Pal into an eveN better scanner, if that is possible. This is the mark of a great company with creative minds. Improving on a brilliant product like the Flip-Pal is not easy and highly unlikely once a company scores a hit. Much like Apple, Couragent is continually working on innovation and improving amazing products. Couragent is soon releasing the ( "the Flip-Pal II) later this year as they introduce the Capture-ID. Technically this is not the Flip-Pal II but it is the slightly larger version for business. The bonus for the Capture-ID is the scan to binding technology that has been a long time coming for a scanner. This technology allows the wave that is always in play when trying to scan the page of a bound book to be eliminated. Some how, some way the brilliant minds at Couragent have figured out how to straighten the portion of the page that is close to the binding and would always appear as a wave. Check out both of these amazing portable scanners here at The Flip-Pal.Com and Couragent.net. When you Buy A Scanner, you should Try Neat and get A Neat Receipts Portable Scanner. The NeatReceipts scanner and Neatworks software lives up to the hype and it does things that make scanning and organizing much easier and faster. If you scan receipts that are shorter than 8.5 inches you can insert the receipts in side ways and the Neatworks software will automatically rotate and crop the scan for you. It is very cool. If you buy a scanner for your receipts or your business, Try Neat and Buy A Scanner. You will see a drastic reduction in your paper clutter and you will improve your productivity the first day you use the NeatReceipts Scanner. I love NeatReceipts and I love using the NeatWorks software . It has already cleared much of my paper work mess from my desk and made it much easier to find things. I also don't have to worry about losing paper work since it is saved on to my computer. You can find out more information on the TryNeat line of scanners and before you buy a scanner go to the the website buyscanner.net and get more information for your purchase. The business of paper work is not always on the mind of sales people or risk takers who start up new businesses but it this can cause problems in the future. Two scanners that can help avoid the paperwork problems are available here and are called NeatReceipts and NeatWorks. The last thing you need to have on your mind when you are starting your new business is an issue with lost receipts or lost expense account notes. entrepreneurs have to think about running their business and generating sales rather than spend hours being an account on top of being sales person and manager. Today's Technology makes life so much easier by allowing all your documents to be scanned into digital form and kept neatly on your computer. A scanner is the first thing you need to buy before you get overwhelmed by the load of paperwork. You should look at several different scanners before you make your decision to buy but you can start here and look at the models available from the Neat company. Neat sells the Neatdesk and the NeatReceipts scanners and they have excellent software as well. The desk top scanner is so powerful ( the neatdesk) that is is a perfect scanner for many applications and you should considering buying a Neat Desk. It also has an automated document feed that will accept up to 50 documents at a time. If you have a large number of invoices or billing sheets this machine will save you time and money in the long run. The Neat Company brain truss has created two top of the line scanners that can be of service to just about anyone. Try them out here. Neat Desk and Neat Receipts. They are worth checking out. If you are starting a business it is extremely important to keep clear and detailed records of your income and expenses. TryNeat with Neatdesk and NeatReceipts and you will be ahead of the game. Often entrepreneurs have their mind on other things besides record keeping and planning ahead for tax time. However, it is much easier to keep track of receipts and expenses due to the improvements in scanning technology. There are several portable and desk top scanners available that will be a great investment for anyone starting or growing a business. If you want to TRY NEAT you can go with NeatReceipts portable single sheet scanner that is the perfect size to take with you anywhere. It is especially great for receipts of course it will handle larger documents also. The Neatworks software is excellent and allows it allows you to key word search your documents once you have them on your computer. The Neat Company also has a powerful desktop scanner they have coined the Neat Desk. It also has an automated document feed that will accept up to 50 documents at a time. If you have a large number of invoices or billing sheets this machine will save you time and money in the long run. The people over at the Neat Company have created two very solid, user friendly scanners in Neat Desk and Neat Receipts. They are worth checking out.